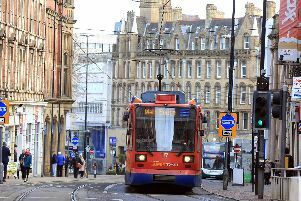 Lord Mayor Magid Magid has issued a rallying call urging people to celebrate everything good about our city, bring communities together and raise money for charities with a Love Sheffield day. Magid said it will be Sheffield’s answer to Comic Relief and promises to be a big day with all people from across the city getting involved. He added: “The whole idea behind it is trying to get people to commit to just one day of just doing something - you can kind of compare it to Comic Relief but just very Sheffield focused - and trying to get schools, businesses, basically the whole city involved. “So as well as fundraising and having lots of little events throughout that day, it’s trying to get loads of different communities to come together and celebrate why they love Sheffield. It will take place in May and will be the finale to his year as Lord Mayor. It will also be the peak of his fundraising efforts, with which he is aiming to beat the national record for Lord Mayor charity funds. Each year Lord Mayor’s choose a number of charities to support throughout their term. Magid has chosen Sheffield Flourish, who support people with mental health issues, Unity Gym Project, who support young people, and Sheffield Women’s Counselling and Therapy Services, who support women who have suffered abuse or trauma. The national record is currently held at £80,000 by a former Lord Mayor of York and the Sheffield record is around £30,000. Magid is hoping to smash these by raising £100,000. He said: “I’m very ambitious. I like to think I can raise £100,000 by May next year. It’s a bit of competitiveness but, of course, fundraising is a big aspect of it but it’s also about supporting the charities and raising their profile and just giving them the support they need. “There are some really large charities that do amazing things that have already got a massive profile in Sheffield so for me it was quite important to really get behind smaller charities and I felt would have the most impact on as a profile and whatever income is generated would have more of an impact on them. He added there will be an open get-together in the Town Hall on Tuesday, September 18 at 6pm to share ideas about Love Sheffield and gather volunteers. He also encouraged people to get in touch with him via email at hi@magicmagid.com or tweet him @MagicMagid.